The Poutinerie, purveyors of probably the best poutine in town. Many a Londoner will have had a great night out end in the marvellously mucky take-out snack that is cheesy chips and gravy. But lovers of this 3am favourite are about to get their minds blown. Allow us to introduce to you... poutine. This indulgent comfort dish stems from the Canadian province of Québec, and it's not all too easy to track down in London. So what makes it worth the hunt? In poutine, the chips are crunchy-on-the-outside, fluffy-on-the-inside french fries, deep fried to golden perfection and crispy enough to withstand lashings of thick, meaty gravy. Chicken gravy and beef gravy are typical favourites, but veggie options aren't frowned upon either. And the cheese. Cheese curds are the hallmark of a 'proper' poutine, and are essentially small, solidified balls of curdled milk. The taste is cheddar-esque — in fact they're often produced during the cheddar-making process — but the texture is much lighter, more like mozzarella. Most importantly, these delicious savoury chunks won't completely melt when faced with a tide of warm gravy. Any true Québécois would almost certainly be horrified by the pale, wobbly cheesy chip offerings proffered by most British takeaways, but there are a few places in London where you can get your hands on authentic poutine. Give it a go and thank us later. Oh, and you pronounce it "poo-teen". Team it with a french accent, if you really want to show off. If, like us, you take your poutine seriously then one option stands head and shoulders above the rest: The Poutinerie. We think this is the best, most authentic poutine there is in London. The only catch is you'll have to plan your face-stuffing in advance as this street food stall roams all around the capital, regularly popping up at Victoria's Cardinal Place and Spitalfields Market. They're reliably pitched up at Brick Lane Market on Sundays though. Catch them and you'll be rewarded with a poutine portion made by real Canadian hands. Yep, the owner is from the Great White North so you can be assured that bonafide cheese curds are on the menu, along with skin-on crispy fries and some of the richest gravy around. Vegetarian gravy is on hand too. Enjoy it as the classic dish, or turbo-charge it with a weighty portion of slow-cooked pork rib meat on top. 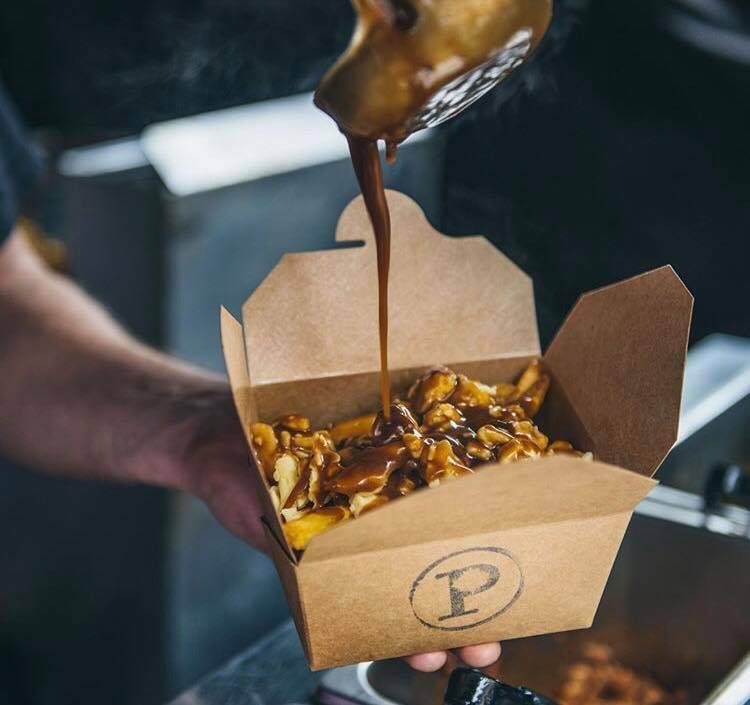 The Poutinerie travels around London, but you can regularly find it in Brick Lane, Spitalfields, Victoria, Farringdon, Regent's Place and more. They announce their monthly schedule in advance, so keep your eyes peeled on their social media channels. The concept at Dip and Flip is simple: order a roast meat sandwich and dip it in gravy, or order a juicy, flavourful burger... and also dip that in gravy. So while poutine doesn't take front and centre stage on the menu (it's actually listed on the menu as 'cheese, fries and gravy' — pah) it is there. And more than that, it's pretty decent. For a restaurant that takes it meat juices so seriously, you can be sure that the gravy is top notch, and that's what really keeps us from dwelling too much on the fact that it's mozzarella that crowns the dish rather than authentic cheese curds. But when the gravy is this good, only the purists will mind. Dip and Flip has four London locations: the original site in Battersea, plus newer venues in Wimbledon, Tooting and Brixton. If you can summon enough willpower to not simply dive headfirst into the cheesy fondues on offer at this fromage-filled venue, then reward yourself with a pioneering poutine with a British twist. All of the cheeses on offer at this Camden restaurant are sourced from local farms around the UK. The cheese curds that form part of The Cheese Bar's poutine come all the way from Quicke's Farm in Devon. Coming loaded with chunks of roasted chicken and sprinklings of crispy sage, it's not the most traditional poutine but by jove, it's good. And big enough to share too. The Cheese Bar, Unit 93/94 Camden Stables, Chalk Farm Road, NW1 8AH. As you might have guessed from the name, this central London pub is Canadian at heart. Pull up a pew at the Maple Leaf and watch an ice hockey game with a bottle of Molson Canadian in one hand and a steaming bowl of poutine in the other. The food is undeniably pub grub — no Devonshire farm cheeses here — but what it lacks in refinement it makes up for in tastiness. Legit cheese curds are used and serious bonus points are awarded for variety. There are no less than eight poutines to choose from, ranging from the Classic to the Hogtown, which comes piled with bacon, sausage, mushroom and crispy red onion. Maple Leaf, 41 Maiden Lane, WC2E 7LJ. 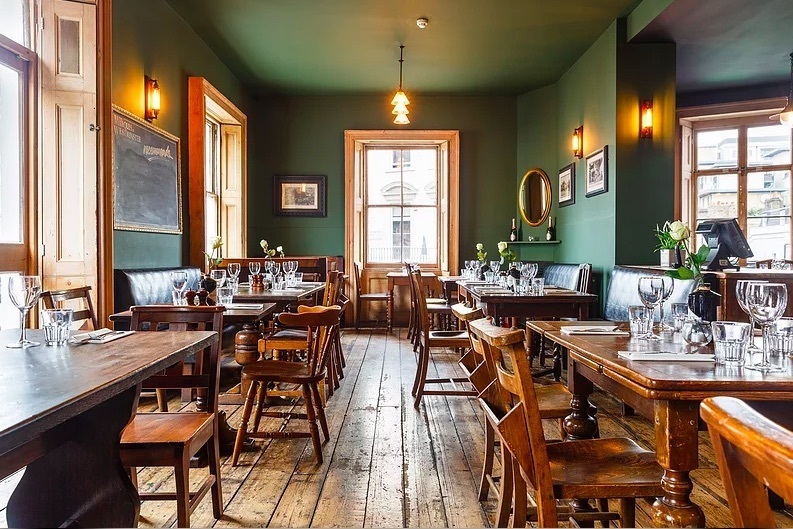 It's not easy to find a classy, airy and reasonably priced eatery slap-bang in the middle of Fitzrovia, and yet, here is Riding House Café. The excellent breakfast options are what really bring in the punters, but make sure to check out that poutine nestled away on the brunch, lunch and dinner menus too. Order it simply as a side — a hearty, delicious alternative to regular chips — or integrate it into a tapas-style meal alongside a bunch of other small sharing plates. Poutine with chargrilled cauliflower? Poutine with seared scallops and pancetta? Poutine with tingly sriracha-glazed chicken wings? Be still our beating heart. Riding House Café, 43-51 Great Titchfield Street, W1W 7PQ. If you're not adamant that only the most authentic of poutines will pass your lips, then The Marquis of Westminster's humble offering might just cut the mustard. It's a tasty option, mostly thanks to the lashings of homemade gravy you'll find slathered over the crispy fries. This pub is known for its fine roasts and is reliably packed out of a Sunday lunchtime, so you can be sure the gravy is up to scratch. It's the cheese — American rather than curds — that may be the deal breaker for poutine aficionados. But for everyone else, job's a good'un. The Marquis of Westminster, 50 Warwick Way, SW1V 1RY. Beef and Brew specialise, perhaps unsurprisingly, in great steaks and great beer. It's a classic combination, but that doesn't mean they don't know how to serve up one heck of a curveball. Take their poutine for example, where you'll find the expected chunky fries and beefy gravy, but topped with none other than beer cheese. Yes, these guys seem able to work beef and/or beer into almost anything, and their poutine is no exception. It's by no means traditional, but it adds a deeper savoury dimension to an already indulgent dish. Beef and Brew, 323 Kentish Town Road, NW5 2TJ and 33 Downham Road, N1 5AA. 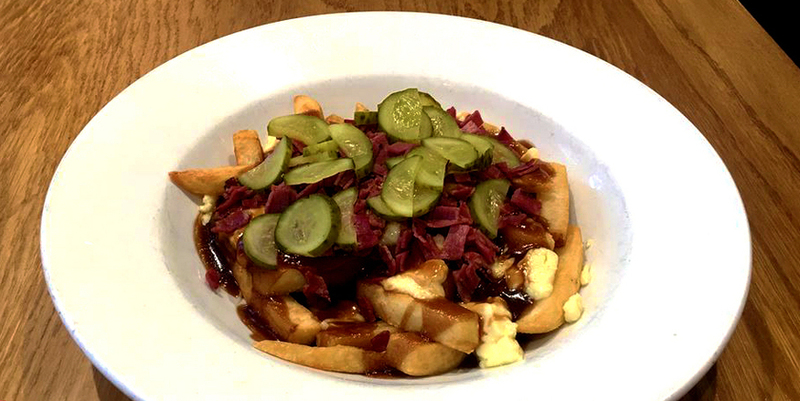 If you want to take the poutine goodness home with you, why not have a crack at making it for yourself? Any foodie worth their salt should already have a decent gravy recipe up their sleeve, but cheese curds may prove a little harder to track down. Neal's Yard Cheese in Covent Garden is the most reliable stockist we've found, and you can order them online too.